Just how do Cadbury get the caramel into Caramilk chocolate bar? Cadbury Adams in Canada reveals the Caramilk secret in the form of modern dance. Five chocolate male dancers are joined by three caramel female dancers to produce a bizarre interpretation of Caramilk manufacture. Viewers are invited to www.stillwondering.ca where they can watch a range of commercials, including Xhosa, Cockney, 5 Year Old, Speed Reader, Whale Song, Fax Machine, Language of Elves, Shorthand and Doctor’s Note. Caramilk is a well-loved brand entrenched in Canadian heritage for over 40 years. It currently holds the number four spot of the top single chocolate bars across the Canadian market. The Caramilk secret is intrinsically linked to the make-up of the bar, a salute to a 35-year consistent advertising campaign involving over 16 television commercials. Even years after the campaign launched, many consumers will still fondly recall the mystery surrounding the Caramilk Secret: how do you get the soft flowing caramel into the Caramilk bar? 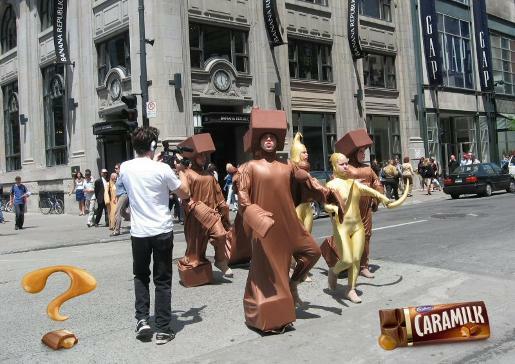 The Caramilk Modern Dancers take the campaign to the streets of Montreal, Quebec. The Caramilk Secret campaign was developed at Saatchi & Saatchi New York, by chief creative officer Gerry Graf, creative directors Chris Beresford-Hill and Nick Spabr, art director Alan Vladusic, copywriter Asheen Naidu, senior agency producer John Doris, director of broadcast production David Perry. Filming was shot by director Ulf Johansson via Smith & Jones Films. Editor was Andrea MacArthur at Peep Show. Post production was done at Method Studios. Audio mix was done at AudioEngine by Rob DiFondi.